Our announcement cards are shown on the ordering page as thumbnails. To view a large sample card simply click on the image or the title of your chosen card and you will proceed to the first stage of ordering where you will see a large image of the card. If you would like to select another card then just click - back - or select back on your browser and you will again be at the selection page where you are able to choose another card. 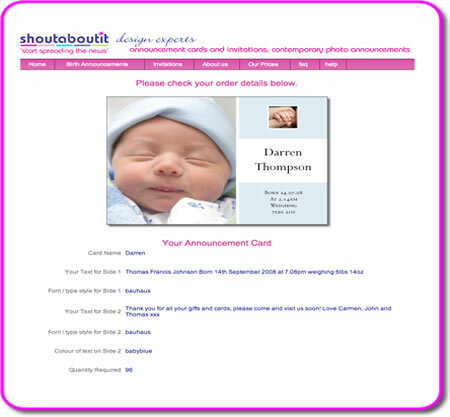 After selecting your card, you may personalise your announcement with your own introduction and baby's name, weight date/time of birth, and message if required. 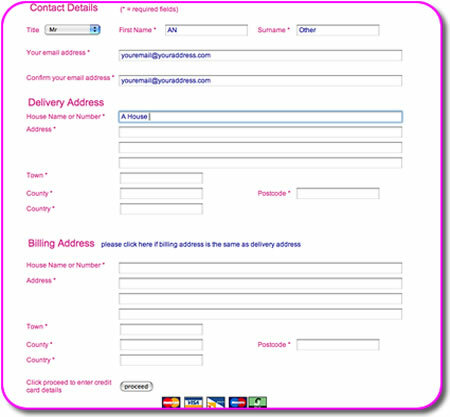 Then select a font style, colour and quantity; when you proceed our website will allow you to review your entry before proceeding to the delivery and billing stage. On the final page you may check all your order's details and upload a photo from your computer with your order. If you need to change the quantity of your order you can still do so on this final page. Our prices are the same for all our customers we donate £1.00 for every order to the Buckinghamshire Hospital Charitable Trust Fund Registered no. 1053113 in aid of SCBU (High Wycombe) Fund 5822. Please enter your details carefully. If your billing address is the same as your delivery address you can click on the text next to the Billing Address title, which will populate the billing address fields for you. 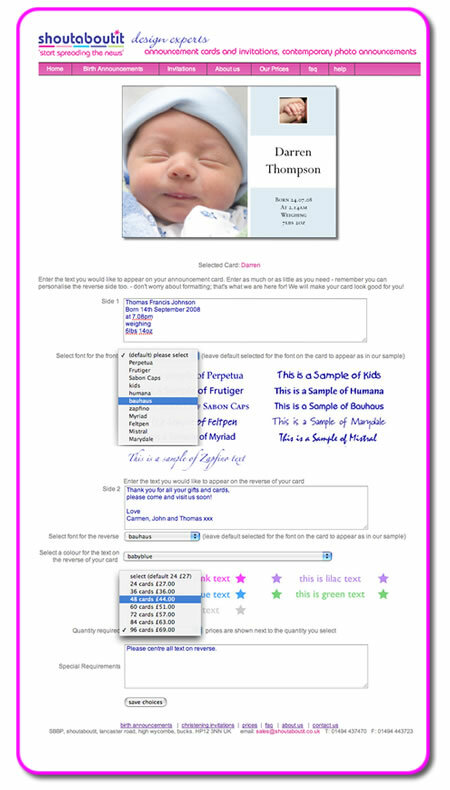 At the end of the personalisation you can select the photo or photos you would like to appear on your card from a computer's hard drive or your camera's memory card by selecting 'choose file' and browsing to the required image (we accept jpg, jpeg, tif, eps or bmp images, we recommend that your image files are approximately 1700px by 1660px or between 1Mb and 2Mb in file size.) below each upload field you can - if you choose, advise us of any preferences regarding that image If your announcement card does not require a photo or you would like to email your photo seperately, then you can skip this stage. For tips on how to take your announcement photo click here.